CORONA, Calif. -- Somewhere between beauty and brutality lays the Champions Club at the Retreat. An oval green awaits on no. 3 at Champions Club at the Retreat. Recently renovated to soften the challenge five years after its 2006 debut, the succinct views of one high-handicap player undoubtedly echo the impressions of most century scorers that have sampled these grounds. "It's very, very pretty, but I wish I'd played better," said Bert Avellana, of Orange. "It's my first time out here, and it's a very tough course. It's playable, but it's really for a skilled player." 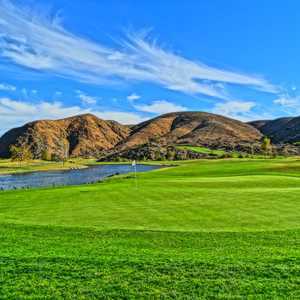 Cut through the Temescal Valley and routed with spectacular elevation changes, this creation from Nicklaus Design is an Inland Empire gem that should be on the list of all southern California low-handicappers. But even after the course removed 16 fairway and greenside bunkers and softened greens in the summer of 2011 -- this isn't the spot to shoot a career round. "Maybe Jack Nicklaus had a bad day when he was out here a couple of times," joked Scott Wasco, head professional at the Champions Club at the Retreat. "I think most people are thrilled with the renovations. The course is now more player-friendly, and we're starting to get a lot busier. More people are now happy when they leave instead of slamming their trunks. There was some trunk-slamming going on before." Just 6,765 yards from the tips (with only one par 4 more than 443 yards), the Champions' test isn't about distance. Rather, the trial comes in the form of distinct shot-making from both the tees and fairways, the latter of which present a consistent slew of uneven stances. "There aren't many level lies on the course," Wasco said, "so you need to know how to hit those shots." To score -- or at least not lose a handful of balls into the grabby, fairway-lining brush -- one also need be highly respectful of the layout. Modern GPS on the carts will aid in direction, though playing short and safe will prove paramount to keeping your round fueled. The 485-yard, bunker-laden, par-5 first hole is evidence of this as well. A downhill tee shot requests an accurate 200 yards before a pronounced dogleg left asks for carry over an intimidating ravine. When bunker removals were underway, the Champions' brass wisely decided to flip the scorecard as well. "When the course was renovated, we also reversed nines," Wasco said. "When the course first opened, no. 1 - no. 4, which are now no. 10 - no. 13, were the teeth of the golf course. They are, without a doubt, the toughest holes on the course. Before, people were mad by the time they got to the fifth hole." Such anger may be assuaged by ample scoring chances on the front before said opportunities indeed become grisly at the turn. The stunning beauty of the 415-yard, par-4 10th is sobered by a rollercoaster ride of elevation. After a downhill tee shot that requires placement before a ravine, the hole moves drastically uphill before a large, sloping green. The ensuing par-4 11th presents one of the challenging approach shots in all of southern California. "The hole that's most talked about as far as being the most difficult is no. 11," said Wasco. "It's about 460 yards from the back tees, and you really can't see where you're hitting it. So you need to aim at the hill on the right and know that everything kicks left. But the second shot is what makes the hole so hard -- it's straight uphill with a longer iron. And the green is about as big as my office." The Champions' top-handicap hole follows on the par-4 12th, which surely sees ample tee shots that are too long or too straight. The wise will club down on the tee to avoid out of bounds beyond 250 yards, while the talented will be able to cut the hole down with a learned draw. The nasty stretch concludes with the Champions' longest par 3, a 200-yard ball eater with trouble everywhere. "On no. 13, the green is very long and narrow, and there's no bailout," Wasco detailed. "There's hazard to the right, and there's a little bunker about as wide as a pencil that if you're in it, you've got a downhill lie. It's fair, but it's a tough test." If you're ready for an earnest test of accuracy, then the Champions Club will take your game to the limit. High handicappers will struggle here, though the consistent beauty of the surrounds will pacify those with the right attitude. Full practice facilities are present, and instruction is available to players of all levels. Tip: Make of the Champions' exceptional Web site, which includes thorough hole-by-hole descriptions that link to succinct videos for each shot on every hole.